This page uses web-hooks which is a web API built in to Ultimate Watch 2. You can use the same web-hooks to control Ultimate Watch 2 from automation software such as IFTTT, MS Flow, Stringify or your own application. Please read more about it on this web page. This action is used to download a user preset to your watch. The link you supply will be sent to the watch and then automatically downloaded. You can then install it as a User Preset. The links have to be direct download links, meaning they should link directly to the preset files and not a web page with a download link. The exception is Google Drive or Dropbox shared links. UW2 will automatically convert these links to direct download links (as by default they point to a Web page). 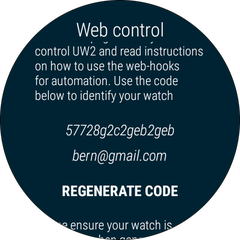 ​​To get the code that identifies your watch, you need access to your watch (note that you only have to do this step once). Please open up the configuration menu on the watch (long press on watchface). Then scroll to the Web control menu and make a note of the code. If you have never generated the code before, then press the button Regenerate Code to get a code. Please make sure that your watch is connected, preferably to WiFi, before you do this. When you press the button you need to authenticate yourself using your Gmail account. After you have gone through the authentication dialog the user code will be generated. Note that it can take some time before you get a response from the server. After you have generated the code press the Open Browser button. This will open up a web browser with this web page on your phone. The user code will be automatically filled in. It is recommended that you bookmark this page on your phone so you don't have to fill in these details every time. You can use this bookmark to open the page from other platforms such as your computer or tablet. ​How can I bookmark this page so I don't have to fill in the code every time? If you opened this page by pressing the Open Browser button on the watch this is easy: Just bookmark the page, and the code will be prefilled every time. If you opened this page in any other way you need to bookmark this page and then edit the bookmark. Change the page address to http://www.stefanowatches.com/web-control.html?code=[your user code] and then save the bookmark. Please make sure that your watch has a connection to the internet. Preferrably a wifi connection since Bluetooth can be slow and unreliable. You can also try to temporarily turn off Bluetooth to make sure that the watch is using wifi. This is most likely due to that your watch address has been changed by Android. In that case please regenerate the code as described above.